Danelectro Challenger Series D Model 89 Model Tube Amplifier (1956), made in Red Bank, NJ, cream textured Tolex finish. Height is 22 in. (55.9 cm. ), 22 1/4 in. (56.5 cm.) width, and 9 1/4 in. (23.5 cm.) deep. A very clean example of this cool early Danno amp, and sweet-sounding too. This was one of the company's larger amps of the period, based around 6V6 power tubes and a single 12" speaker, with the preamp section mounted above and the power amp at the bottom of the chassis. Appears all original, except for a repro handle, even down to the coke-bottle power tubes. There is some light wear to the covering, but nothing too serious. Darker sounding than the typical Fender, this amp swells into rich overdrive fairly easily. 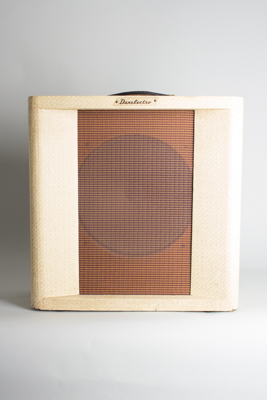 The perfect mate for a 1956 Danelectro U-2, or any cool and funky 1950s single-coil guitar. Excellent Condition.